23 candid couple shots with funky colourful smoke bombs! 1. 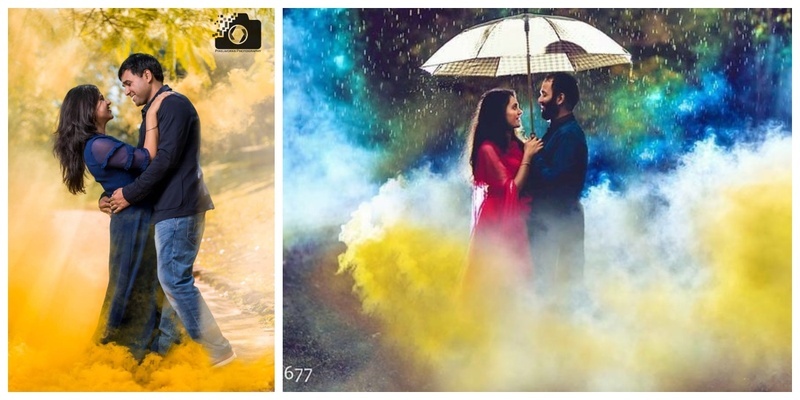 The kissing couple shot amidst the colourful foggy smoke! 2. The rocking couple with a colourful rickshaw entry! 4. The smoky red bride in the smoky red shot! 7. Haldi ceremony with a bang of colours! 11. The monochromatic smoke extravaganza! 16. Perfect posers in the yellow hue smoke! 17. Couple’s colourful entry with dhol to the Mehndi ceremony! 18. Cute couple photography with friends helping to create a colourful ambience! 19. Colour bomb attack for the gorgeous sunglasses bride! 20. Sunset couple shot amidst the smoky blues! Image Source Pinterest unless specified!